Blaise Pascal (June 19, 1623 – August 19, 1662), was a French mathematician, physicist, inventor, writer and Catholic philosopher. He was a child prodigy who was educated by his father, a Tax Collector in Rouen. 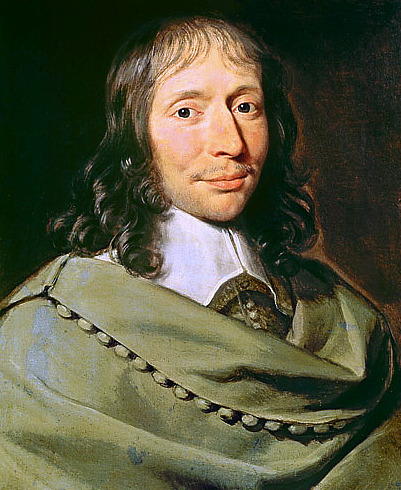 Pascal's earliest work was in the natural and applied sciences where he made important contributions to the study of fluids, and clarified the concepts of pressure and vacuum by generalizing the work of Evangelista Torricelli. Pascal also wrote in defense of the scientific method. In 1642, while still a teenager, he started some pioneering work on calculating machines, and after three years of effort and 50 prototypes he invented the mechanical calculator. He built twenty of these machines (called the Pascaline) in the following ten years. Pascal was a mathematician of the first order. He helped create two major new areas of research. He wrote a significant treatise on the subject of projective geometry at the age of sixteen, and later corresponded with Pierre de Fermat on probability theory, strongly influencing the development of modern economics and social science. Following Galileo and Torricelli, in 1646 he refuted Aristotle's followers who insisted that nature abhors a vacuum. His results caused many disputes before being accepted. In 1646, he and his sister Jacqueline identified with the religious movement within Catholicism known by its detractors as Jansenism. His father died in 1651. Following a mystical experience in late 1654, he had his "second conversion", abandoned his scientific work, and devoted himself to philosophy and theology. His two most famous works date from this period: the Lettres provinciales and the Pensées, the former set in the conflict between Jansenists and Jesuits. In this year, he also wrote an important treatise on the arithmetical triangle. Between 1658 and 1659 he wrote on the cycloid and its use in calculating the volume of solids. Pascal had poor health especially after his eighteenth year and his death came just two months after his 39th birthday. 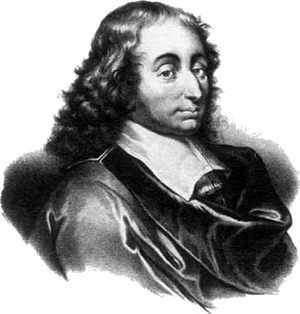 Blaise Pascal (Clermont-Ferrand, Auvernia, Francia, 19 de junio de 1623 - París, 19 de agosto de 1662) fue un matemático, físico, filósofo y teólogo francés, considerado el padre de las computadoras junto con Charles Babbage. Fue un niño prodigio, educado por su padre, un juez local. Sus primeros trabajos abarcan las ciencias naturales y aplicadas, donde realizó importantes contribuciones para la invención y construcción de calculadoras mecánicas, estudios de la teoría matemática de probabilidad, investigaciones sobre los fluidos y la aclaración de conceptos tales como la presión y el vacío, generalizando la obra de Evangelista Torricelli. También escribió en defensa del método científico. Pascal fue un matemático de primer orden. Ayudó a crear dos grandes áreas de investigación, escribió importantes tratados sobre geometría proyectiva a los dieciséis años, y más tarde cruzó correspondencia con Pierre de Fermat sobre teoría de la probabilidad, influenciando fuertemente el desarrollo de las modernas ciencias económicas y sociales. Siguiendo con el trabajo de Galileo y de Torricelli, en 1646 refutó las teorías aristotélicas que insistían en que la naturaleza aborrece el vacío, y sus resultados causaron grandes discusiones antes de ser generalmente aceptados. En 1646 su familia se convirtió al jansenismo, y su padre murió en 1651. Sin embargo, tras una profunda experiencia religiosa en el año 1654, Pascal sufrió una "segunda conversión". Abandonó las matemáticas y la física para dedicarse a la filosofía y a la teología, publicando en este periodo sus dos obras más conocidas: Las Lettres provinciales (Cartas provinciales) y Pensées (Pensamientos). Ese año también escribió un importante tratado sobre el triángulo aritmético. Entre 1658 y 1659 escribió sobre la cicloide y su uso en el cálculo del volumen de los sólidos. Pascal tuvo una salud muy endeble a lo largo de toda su vida, y su muerte acaeció dos meses después de haber cumplido 39 años.